It’s something Shaun Nelson really wasn’t accustomed to – getting compliments about the shuttle service. DMC’s new shuttle service is into its eighth month and Shaun Nelson, Director of DMC Internal and External Transportation has been getting compliments from riders. Though often overlooked, the job of getting employees, patients and visitors to and from their destinations is indispensable to DMC’s operations. As such, when CEO Joe Mullany steered DMC along a new path to becoming a Top 15 healthcare system, Nelson fully understood that his department also had a role. “I started looking for a company that understood where we are trying to go and could develop policies and procedures that would help us reach our goal,” Nelson said. Armed with learning’s from previous years, and a better knowledge of what riders wanted and needed, the DMC selected Trinity Transportation. The DMC was a new challenge for Trinity. “It was exciting for them and for us because for the first time we were able to build what we wanted,” Nelson said. 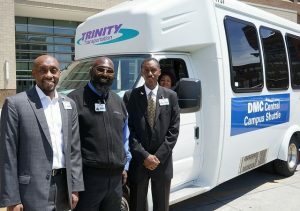 “What Trinity offered was new buses, great, professional, customer-friendly drivers and staff who desire to be part of DMC, not just contractors,” Nelson said.